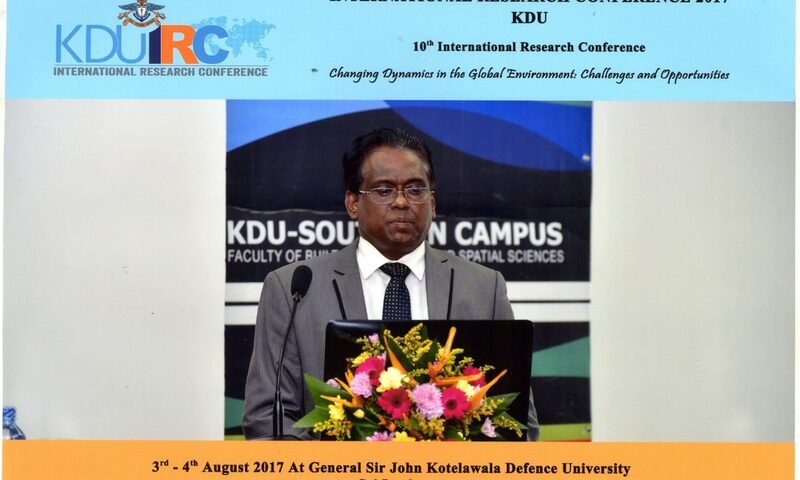 Architect Prof.Lalith De Silva attended as a plenary speaker of the 10th International Research Conference of General Sir John Kotelawala Defence University, held under the theme of “Changing dynamics in the global environment: Challenges and opportunities” on the 3rd and 4th August 2017. 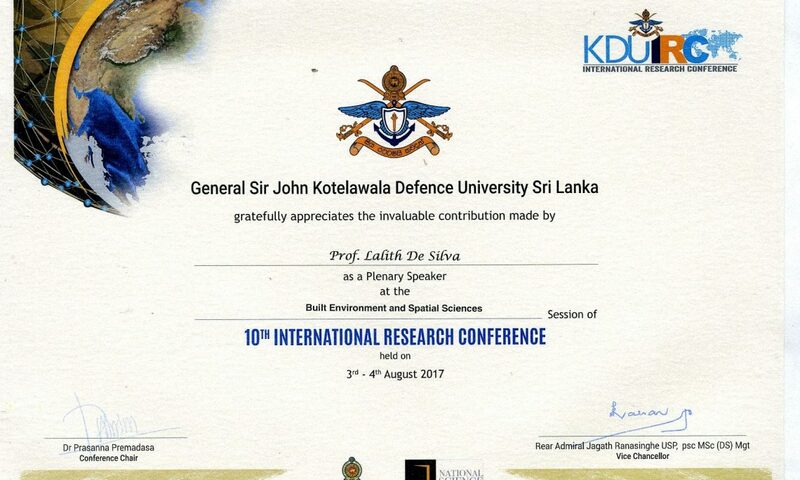 He presented on “Modelling the relationship between spatial characteristics of urban land uses and household travel patterns (A Case study of Colombo DS Division)” at the Built Environment and Spatial Sciences plenary session of KDU IRC 2017, which added great academic value to the conference. Abstract: The city is considered as a complex system with the interaction of numerous sub systems and transportation, which is the main crucial sub system of urban area that determines the activities (Handy, 1998). Some of burning issues in urban area at present had significant influence on direct and indirect connections with lack of integration of land use and transport (Litman, 2012). Land use and transportation system are considered as two most important systems that determine the function of the area. The relationship between the land use and transportation has been accepted within many disciplines such as urban planning transport planning, geography and economy. Different strategies such as job housing balance, transport oriented development, transit villages, smart growth, etc., have been adopted in the present urban planning as alterative ways to integrate the land use and transportation more effectively (Xueming, 2013). This research reflected on the relationship between land use characteristics and household travel pattern within an urban area by considering household socio-demographic factors. The study was carried out within the Colombo DSD area in Sri Lanka to estimate the relative importance of various land use characteristics on travel pattern. Household questionnaire survey was carried out to identify the general household travel pattern with the Colombo DSD area. Multiple regression modeling technique, ArcGIS and SPSS were utilized to conduct the required land use and travel pattern analysis. The relationship among spatial characteristics of land uses and household socio economic characteristics on the household travel pattern was evaluated by using Pearson correlation analysis and stepwise multiple regression analysis.